"I don't believe I'm seeing this!" Comics in the 90s were an interesting time. Marvel was bankrupt, DC was floundering and everyone was after variant covers. Image Comics was just a young upstart of comic hot shots, but they put out a series that was a gritty take on the Teenage Mutant Ninja Turtles. 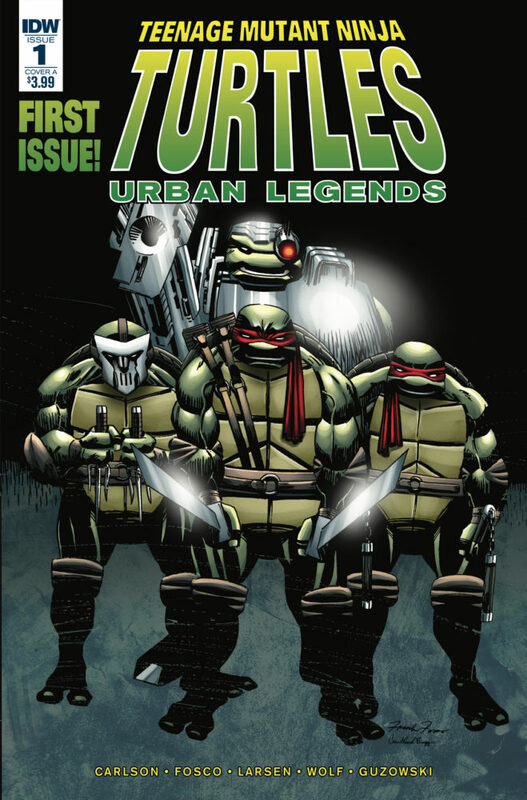 The series wasn't entirely successful commercially, but that didn't stop IDW Publishing from republishing it as Teenage Mutant Ninja Turtles: Urban Legends #1. The issue is written by Gary Carlson, illustrated by Frank Fosco, inked by Erik Larsen and Chance Wolf, colored by Adam Guzowski and lettered by Chris Eliopoulos. In this premiere issue, the TMNT and Master Splinter are attacked in their lair by a group of cyborgs led by the female ninja called Pimiko. Before the attack is over, one family member will fall and one will be lost! The Turtles have generally maintained a family-friendly vibe, but Carlson's run on Teenage Mutant Ninja Turtles Volume 3 in the 90s was significantly darker and grittier. And that approach gives Teenage Mutant Ninja Turtles: Urban Legends #1 a maturity to it that might have been ahead of its time decades ago, but feels more appropriate now. The Turtles have always put themselves in harm's way and Carlson isn't shy about showing the reader that. Carlson also doesn't focus as much on each Turtle's personality carrying the dialogue; in fact, really on Donatello and Michelangelo seem to demonstrate traits that make them familiar to readers. The issue also ends with a fairly dramatic event that certainly sets the tone and direction for the duration of the series. Fosco's illustrations are drawn in a very clear 90s style. Pimiko and the cyborgs sport overly muscular physiques (Pimiko in particular looks like very 90s-Image) while the Turtles are squatter with more mass. The use of very tight perspective by Fosco makes some of the action a little difficult to follow because so much of the pages are taken up by body mass. Panels are presented just as frenetically as the characters rendered by Fosco, providing further murkiness at some points. That also might have to do with the fact that originally the work was black and white, but Larsen and Wolf do an admirable job inking while Guzowski's colors are vibrant. Teenage Mutant Ninja Turtles: Urban Legends #1 is very much a throwback to a different era in comics. The Turtles maintain their core characteristics that make them readily familiar to readers, but their faced with a situation that's a lot tougher than other adventures they've been privy to. Carlson's script is definitely more mature than most other TMNT stories. The illustrations by Fosco evoke a time in comics when characters were illustrated with over-exaggerated physiques. Teenage Mutant Ninja Turtles: Urban Legends #1 is a book that for some will be a nostalgic trip, but for others it will be a new take on an old favorite. Teenage Mutant Ninja Turtles: Urban Legends #1 is available now.